MID-CENTURIA : Art, Design and Decor from the Mid-Century and beyond: Bill Hinz Tapestry? 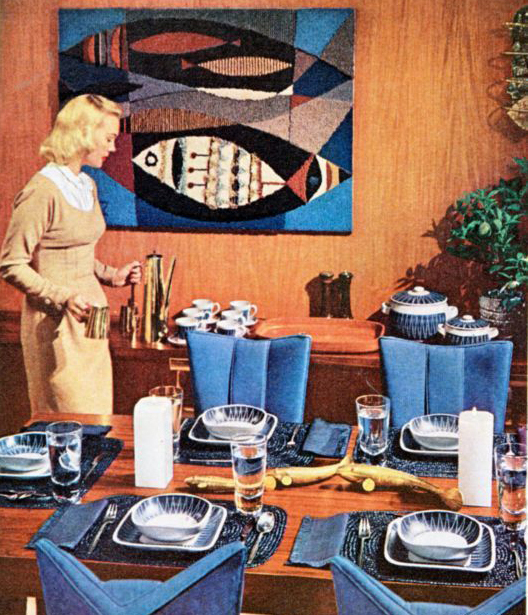 I am not certain, but I would bet that this tapestry seen in the Better Homes & Gardens 1960 "Decorating Ideas" issue is by Bill Hinz. In fact, if you look closely you can almost make out the letter "Z" behind the woman's left shoulder. I am a big fan of Bill's work, check out my previous post on him here. Here is a similar piece depicting fish from Bill Hinz.